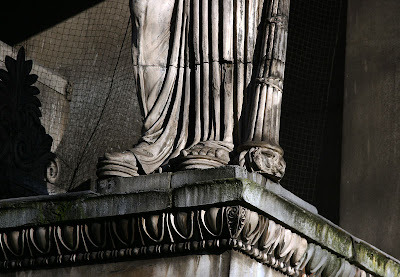 The detail of a statue on the new St Pancras church. New, as in built in the early 1800's. A wee design flaw exists in these figures. They were made a bit too high, so had to be squeezed in a bit in the middle to fit. feet are ok though. Am away for a few days so wont be doing my usual visiting. i like this kind of details ! Really? Was surprised to read your post. I've been there once.Cool to remember that.Thank you. I only read about St. Pancras once, in a book of saints for children. He was called St. Pancratius there. Good to know that he wasn't just remembered in that book. What you consider 'new' is absolutely mind-boggling to me! I love the detail that you have captured. Fancy putting toes into a statue that are hardly ever going to be seen by anyone. Would you say the figures were about a foot too high?